The British Army marched on the Iraqi capital of Baghdad to remove a pro-axis government. A dangerous outlaw regime sits in power in Baghdad; the leader of one of the world’s superpowers decides it has to be removed at all costs; an army marches across the desert to topple it. The situation may sound familiar. The events of 2003 were in some ways similar to that of 1941. Sometimes history does seem to repeat itself. The one solution to both problems was found in T.E. Lawrence’s old ally in Arabia, Prince Faisal. Churchill pressured British officials “to get Faisal on the throne as quickly as possible.” Although he was completely unknown in Mesopotamia, the British announced he had received 96 percent of the vote in a plebiscite. Then, in a dawn ceremony on August 23, 1922, with hardly a native in sight, the British installed him as king of a renamed Iraq (meaning well-rooted country). Nuri as-Said, who fought with Lawrence and Faisal in Arabia, was the country’s dominant political figure as minister of defense (1923-1930), prime minister (1930-1932), foreign minister (1933-1936), then again briefly prime minister (February-April 1940). But support for the British in Iraq extended nowhere beyond him and the monarchy. Nationalists were particularly incensed by the 1930 Anglo-Iraqi Treaty London forced on Baghdad as a precondition for ending the League Mandate. Under it, the British had effective control of Iraqi oil production and foreign policy, military bases for 25 years, and the right to transit troops from India during wartime. British power in Iraq was built on a foundation of desert sand, and when it suddenly shifted in 1941 a British army was again marching on Baghdad, including a politician and a new Lawrence to write about it. Rashid ‘Ali refused to break diplomatic relations with Fascist Italy when it went to war with Britain as Nuri as-Said had done against Nazi Germany during his second brief term as prime minister. He held meetings with the Italian Minister, Luigi Gabbrielli, keeping out Nuri, who was foreign minister again. Colonel Salah ad-Dinn had his own meetings with Gabbrielli to request arms. The regent finally reacted to such intrigues by dismissing the government on January 31, 1941. The Golden Square struck back two months later, seizing Baghdad in a bloodless coup, reinstating Rashid ‘Ali, and sending soldiers to kill Emir Abdul. They were too late. He had already fled, disguised as a woman, to a relative’s house. From there he phoned the American legation and the next morning was being driven west out of town under a rug in the American minister’s car. He reached the British air base at Habbaniya, 55 miles from Baghdad, and was flown to the British base at Basra, 300 miles to the south. From there, he reached final sanctuary with his own uncle, King Abdullah of Transjordan. To the British ambassador, Sir Kinahan Cornwallis, Rashid ‘Ali reaffirmed the Anglo-Iraqi Treaty. Secretly, he asked Gabbrielli about possible air support and arms from the Italians and Germans. Cornwallis had not believed Rashid ‘Ali and, at his appeal, London reinforced Habbaniya with 400 men of the King’s Own Royal Regiment, and Basra with 3,000 Indian troops. Rashid ‘Ali let the challenge pass, not yet ready for a confrontation until assured of Axis support. Pressure from the Golden Square forced him to change his mind, though, and he warned Cornwallis no further troops would be allowed in Iraq until the newest arrivals had passed through. The British response was to send 2,000 more Indian soldiers to Basra. Rashid ‘Ali’s protests to Cornwallis were such that the ambassador ordered the evacuation of British subjects in Baghdad to Habbaniya; only 230 got through before the main road was closed for military traffic, trapping Cornwallis and 500 others on the grounds of the British and American legations. At dawn on April 30, 1941, Iraqi forces began placing artillery and antiaircraft guns on the 200-foot plateau just a half-mile south of the Habbaniya base. By noon 9,000 troops had taken up positions, and armored cars had rolled to within 500 yards of the gates. The base had become a training facility for the Royal Air Force rather than an operational field, and its military resources were minimal. Of its 1,000 personnel just 35 were pilots, older instructors who would have to rely on students for aircrew. Of its 80 aircraft the most modern were only a single Bristol Blenheim bomber and nine Gloster Gladiator fighters; the remainder were obsolete Audax and Oxford trainers, Gordon bombers, and Valencia transports with hastily attached makeshift bomb racks for 20-pound bombs. The base commander, Air Vice Marshal H.G. Smart, sent up a flight of aircraft to test the Iraqis, who did not fire on the planes. Smart put his men to work digging trenches, manning machine guns, and pushing or towing aircraft as far as possible from Iraqi artillery range. After a second day’s standoff, Smart decided on a predawn air strike and ordered a squadron of Vickers Wellington bombers to fly from Basra to join in. The result was an aerial traffic jam in the darkness above Habbaniya. The RAF flew 193 sorties over 14 hours, dropping 30 tons of bombs along with low-level strafing runs on the Iraqi positions. The Iraqis responded with heavy antiaircraft fire, shelling, and air raids using their superior American Northrop fighters. British losses for the day were heavy—13 killed, 29 wounded, 22 aircraft downed or destroyed on the ground—but Habbaniya still held out. Iraq, 1941. Tribal warriors in Iraq attacking a British military vehicle at the time of the anti-British revolt during World War II, May 1941. Base personnel mocked the Iraqi shelling, placing bets on when the water tower would be hit. “It did not seem possible that there were any gunners in the world who could fail to hit it—the slow death of the station would have started,” recorded the official history. On the ground, the King’s Own and the Levies joined in with nightly grenade-tossing raids into the Iraqi positions. After four days, the Iraqis were finished. At dawn on May 6, 1941, the British could see them heading down the plateau to the east toward Baghdad, abandoning guns and ammunition. The British were not finished with the Iraqis. Five miles away, those who were retreating got entangled with a column of reinforcements. The Iraqis answered with a final air raid late in the afternoon, killing seven, wounding eight, and destroying two Oxfords, a Gladiator, and an Audax. In restoring the situation, Churchill had more in mind than merely holding Habbaniya. He was determined to overthrow the Rashid ‘Ali regime in Baghdad. Even while the siege at Habbaniya went on, the prime minister and the chiefs of staff in London began a long-distance argument over invading Iraq with the Commander-in-Chief Middle East, General Sir Archibald Wavell, in Cairo. Clark whittled HABFORCE to a 2,000-man spearhead called Kingston Column (KINGCOL). Despite its small size, KINGCOL had several unusual attributes. There were no fewer than three members of Parliament in it, one of whom, Somerset de Chair, in 1945 published an account of its march on Baghdad, The Golden Carpet. KINGCOL’s commander, Brigadier Joseph Kingstone, “added to the colorfulness of the expedition,” wrote de Chair, by wearing a blue pajama top over khaki shorts at breakfast. Adding even more color were 250 men of the Arab Legion of Transjordan, a bedouin foreign legion led by seconded or retired British officers under contract. One of these was its commander, John Glubb, who wrote of the invasion in The Story of the Arab Legion in 1948. 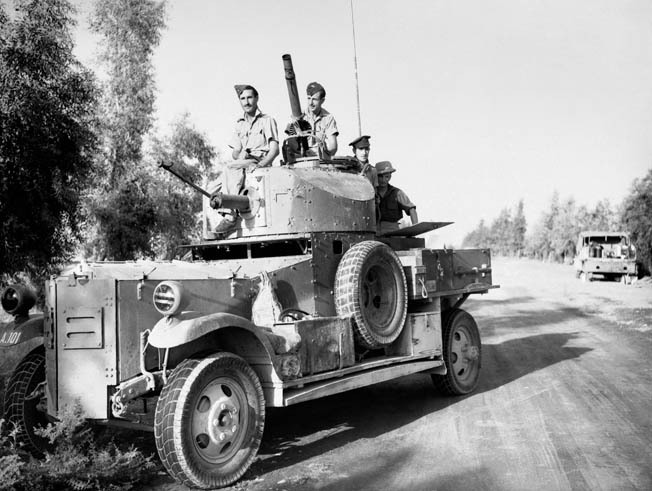 The Arab Legion’s primary role in the invasion was reconnaissance, and Glubb led it across the Transjordan border into Iraq a week ahead of the rest of KINGCOL, even while Wavell was quarreling with Churchill and the chiefs. The Arab Legion would take part in the invasion’s first action, at the fort at Rutbah 200 miles west of Habbaniya. 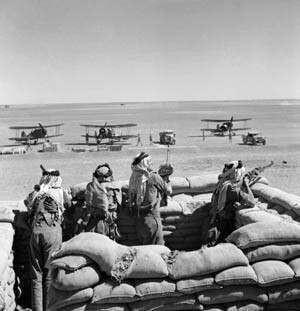 Obsolete Gloster Gladiator biplane fighters are guarded by soldiers of the Arab Legion. Glubb called again for air support. It took two hours for a single plane, then hours later for another, to return and drop a single bomb— which missed. “We lay down to sleep in disgust—this was not such fun, after all,” he remembered. The next day passed in similar fashion with lackadaisical RAF bombing and desultory fire from the fort. That night, a relief convoy of 40 trucks rushed from the darkness into the fort before the Legionnaires had time to substantially react. In the morning, at Pumping Station 3 of the Iraq Petroleum Company pipeline, Glubb met up with an RAF armored car squadron that had just finished a two-day, 1,000-mile crossing from the Libyan desert. While the Legion refitted, the squadron rushed ahead. Early the next day, just as the Legion was catching up with the armored cars, it was found that the fort had been abandoned during the night. On May 12, KINGCOL crossed the frontier between Trans-jordan and Iraq, about 470 miles from Habbaniya and 55 miles east of Baghdad. The column reached Rutbah unopposed in 36 hours, set off again on May 15 and covered 160 miles that day, and finished just 40 miles from Habbaniya. Then Kingstone sent Glubb and the Legion to scout northward while he veered south by compass. However, before KINGCOL had reached Habbaniya, a dangerous new participant had entered the campaign in Iraq. “Just as the tail of the column had been moving off from the camp, four black fighters had roared across the desert drilling the lorries on the ground with bullets and cannon fire. They had disappeared as abruptly as they had come,” wrote de Chair. One of Glubb’s Legionnaires was killed, another wounded, as they stood firing back. Two days into the siege at Habbaniya, Rashid ‘Ali’s brother, the Iraqi minister to Turkey, had formally requested military assistance at the German embassy. Hitler recognized the regime the next day. German aid got off to a bad start when the transport carrying Major Alex von Blomberg, leading the Luftwaffe liaison mission with the Iraqis, flew over Baghdad into an air battle between Iraqi and British fighters and landed dead in his seat with a stray bullet in his head. With the help of the collaborationist Vichy French in control of neighboring Syria, the Germans shipped 15,500 rifles with six million rounds of ammunition to the Iraqis and flew 28 fighters, bombers, and transports into northern Iraq. During the course of armistice negotiations, the crew of a British armored car awaits instructions on the outskirts of Baghdad. There were still 55 miles to Baghdad, but the Iraqis worked to make the trek as difficult as possible for the British and their allies. As they were fleeing Habbaniya, the British opened the dikes on the Euphrates and flooded the surrounding area. Base troops had rehearsed for a crossing in the base swimming pool with skiffs and canoes from the base boating club. On the night of May 18, they crossed the river to take the main obstacle on the road to Baghdad, the town of Fallujah. Beginning at 5 am on May 19, the RAF flew 134 sorties against Fallujah, dropping surrender leaflets along with 10 tons of bombs. Then the loyal Levies made a mid-afternoon shooting rush across a bridge into town and took Fallujah without a single casualty. Those Iraqi soldiers attempting to escape in civilian clothes stood out in army boots. They had not been able to find shoes. The real battle for Fallujah came four days later, with a 2:30 am counterattack by an Iraqi brigade. When the Iraqis’ approach was spotted, Lt. Col. C.J. Hodgson of the King’s Own led a patrol to investigate and died holding them off single-handed with a haversack of grenades. Despite Hodgson’s heroism, the Iraqis were soon in control of the northeastern corner of town, planting machine guns on rooftops. At Habbaniya, Clark ordered Kingstone across the Euphrates to take charge of the battle. Reinforcements were rafted across, and the Iraqis were cleared one house at a time by evening. On May 28, Clark split the rest of KINGCOL for the final drive on Baghdad, advancing from two directions. One column, 500 men under Lt. Col. Andrew Ferguson along with Glubb and his Arab Legion, swept north to the Tigris River to flank the city. Leading the column, Glubb and his men reached Iraq’s second great river on the morning of May 29. Ferguson was being held up by stiff resistance in the brickfields of Kadhimain, five miles from Baghdad, with one killed and five wounded. He ordered Glubb to continue north and cut the Mosul-Baghdad railway at the Meshahida station. He did, after meeting resistance of his own. When they reached the station the next morning, the Legion found it deserted. The main column, including Clark, Kingstone, de Chair, and 750 men, struck eastward up the road from Fallujah. Along the way, de Chair rounded up a crashed Italian pilot and came upon an abandoned agricultural station with 10,000 chickens clucking about. On May 30, just three miles from Baghdad, the column came under heavy artillery and machine-gun fire. An Iraqi shell ricocheted off the mudguard of de Chair’s car without exploding, though shaking up his interpreter and driver. From prisoners, Clark and Kingstone learned that Baghdad was in a state of panic with wild rumors that the British force was 50,000 strong. In a bluff, an interpreter called Iraqi headquarters to report British tanks. As night fell, Iraqi shelling continued, the RAF was bombing Iraqi positions north of the city, and Clark and Kingstone were faced with the grim prospect of house-to-house fighting with just 2,000 men against an estimated 13 infantry battalions and five artillery regiments. Having lost their gamble with Hitler and their nerve along with it, Rashid ‘Ali and the Golden Square were at that moment on the only road still open out of Baghdad, heading east to Iran. Rashid ‘Ali made it all the way to Berlin. Except for a brief return in the late 1950s, he spent the rest of his life in exile, dying in Beirut in 1965. The colonels of the Golden Square got no farther than Iran and Turkey. Over the next four years they were tracked down, returned to Iraq, and publicly hanged. In the resulting vacuum, anti-Semitic rioting and looting broke out, with 150 Jews killed. Despite the finish, de Chair, noted of KINGCOL: “For it is no ordinary army that can cross a waterless desert for the first time in history and deliver at the end of 700 miles of desert a punch which sends a well-equipped army of four divisions reeling into armistice.” He later directed British vehicles when they finally rolled into Baghdad, displaying his celebrated dented mudguard to the regent and young King Faisal II, who had spent the coup and campaign quietly on a royal estate outside Baghdad with his British governess. Glubb preferred to rush home. Like an executive or salesman back from a business trip, he had to persistently knock at his own door at 3:30 am to be let in. Two months to the day he fled, Emir Abdul Ilah returned to Baghdad. In October 1941, Nuri as-Said was reinstated as prime minister and Iraq declared war on the Axis. The British followed up by driving the Vichy French out of Syria. Glubb and the Arab Legion would fight again, and de Chair was critically wounded. History tends to agree with Glubb. Despite the threat that a pro-Nazi Iraq would have been for the British position in the Middle East in World War II, the Iraqi campaign was squeezed from memory between the legends of the Desert Fox and the Desert Rats of the Battles of Tobruk and El Alamain. In 1958, there was another coup in Baghdad. King Faisal, former Regent Abdul, and every member of the royal family down to infants were murdered. Nuri as-Said, still prime minister, tried to escape dressed as a woman like Abdul had but was killed by a mob and his body dragged through the streets behind a jeep. The coup began the chain of events that led to the rise of Sadaam Hussein and ended with another army marching on Baghdad. Tags Allies, Axis, Emir Abdul Illah, George Clark, King Abdullah of Jordan, League of Nations, luftwaffe, Nazi Germany, Nuri as-Said, Rashid ‘Ali al-Gaylani, Royal Air Force, Sir Archibald Wavell, Sir Kinahan Cornwallis, T.E. Lawrence, Vichy regime, Winston Churchill, World War I.